I made this Purple Lotus farming guide to help out players who want to farm the herbs instead of buying them from the Auction House. It's recommended to have around Herbalism 210, so you won't get herb fragments. Purple Lotus can only be found around ruins in Felwood. There are 5 ruins in Felwood where Purple Lotus grows. Usually you can only find 1 Purple Lotus at the smaller ruins, but at the larger ones like Ruins of Constellas you can often find 2-3. 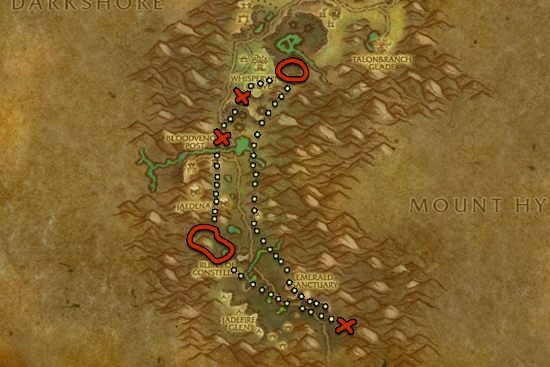 Since this is the only zone where Purple Lotus grows, it's often farmed by someone else. If you visit every ruin and you didn't find a single Purple Lotus it means someone is already farming in the zone. It's possible that you will finish one lap too fast and the purple lotus at the start still haven't respawned yet. To avoid this, when you start your next lap, you should pick up every herb when you move between the ruins, so you finish slower. Or you can just simply wait for respawns every time if you don't want to bother with picking up other herbs.